Daredevil is a character about contrasts. 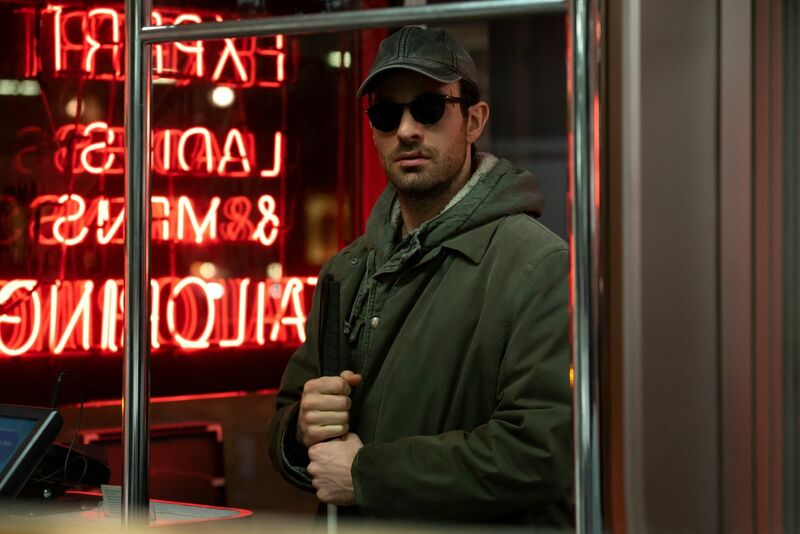 Matt Murdock practices as a lawyer by day, but beats criminals as a vigilante at night. He’s a practicing Catholic, but dresses up like the devil. Also, he’s blind, but he can see the world around him unlike anyone else. Coincidentally, it is the second season of Marvel’s Daredevil that chooses to really explore the dichotomies, not only in its title hero but in those around him and the world at large. Charlie Cox once again stars as the Man without Fear in the series, and brings the same amount of dashing charm and selflessness that makes Matt such a great character. Cox has transcended himself in the role, too. Much like Robert Downey Jr. and Iron Man or Ryan Reynolds and Deadpool, there is no separating the actor from the character; they are one. He provides the pivotal anchor for the rest of the cast, who also continue to hit home run after home run. Elden Henson’s Foggy Nelson is still the perfect Milhouse to Matt’s Bart, the right combination of endearing, annoying, and funny. A combo that personifies the comic book character to a T, and makes him integral to Matt’s story. Furthermore there’s Deborah Ann Woll as Karen Page, bringing a lightness to this supremely dark (in tone and lighting) series. Woll and Cox also work off of each other in perhaps the most believable romantic subplot of the MCU. Then there’s Frank Castle. Jon Bernthal takes on the role of The Punisher for the series, and he brings the goods. This is a character that also has two sides at work, not simply inherent to his actions but in how he is written as a piece of the puzzle. Bernthal can handle the militaristic elements with ease. No one has looked more natural walking down a hall while aiming a shotgun with precision, but when the more sensitive aspects of the character and his background unfold, he’s got it covered. The Punisher is at his most satisfying for an audience as an unstoppable killing machine, always five moves ahead. At his most interesting and nuanced, however, The Punisher is a fatally-flawed and broken individual that is two steps behind. The good news is that you get to have your cake and eat it too. When Bernthal isn’t laying waste to criminals, he’s tasked with delivering Shakespearean monologues, which he hits like a headshot. The bad news, however, is that punches are being pulled with The Punisher. Some fans of the character like him because of the delightfully gruesome and creative ways that he takes down the bad guys. Some of that is certainly on display, but much of it is hidden away from. In lieu of showing a full assault like “The Punisher” movies have, the series opts to show you either the start of the carnage, the end of the bloodbath, or to place focus on a character that has no idea everyone around him is dying. That last one is a fun exercise, but if The Punisher isn’t acting like a tank in those moments where he can, it’s a letdown. The Punisher is a force of nature, which the series fully acknowledges in its opening episode with subtlety and nuance that shows producers Douglas Petrie & Marco Ramirez know what they have, but are seemingly hindered by standards & practices. The first season of Daredevil saw decapitation by car door and self-impalement on jagged glass, but The Punisher’s on-screen violence feels neutered. Maybe they’re saving the big strike for the season finale, or maybe their hands are tied. Tied hands seem to be a recurring motif too. 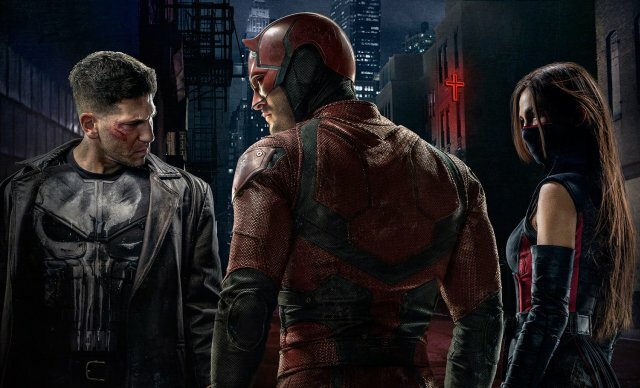 The crux of the first chunk of episodes in season two are at their core, Punisher v Daredevil: Dawn of Defenders. Though the two have few actual scenes of sparring, those they share are incredible. There’s an openness to the visual style of Daredevil Season 2 that compliments the awesome fight choreography too. Whereas the first 13 episodes have an almost claustrophobic feeling, as its visuals reflected the detail-oriented storyline, Season Two’s cinematography by Martin Ahlgren has a wider approach, and a definite comic book panel feel. Though seeing the individual blows make contact is one way to photograph a fight, seeing the entire spectacle unfold brings its own weight to the slugfest. What makes this superhero showdown different, though, is that it’s probably 30% fists and 70% philosophy. Frank and Matt have extensive dialogue scenes so deep and intricate they make you forget you’re watching a show that has previously featured ninjas, but the ninjas are there too. The second season of Daredevil also brings along Elodie Yung as Elektra Natchios, the perfect wrench for everything Matt Murdock. Though The Punisher may be at his most satisfying when he’s a human hurricane leaving a path of destruction, Matt Murdock is at his most satisfying when literally everything is going wrong for him, and Elektra is a guarantee for that. Yung embodies the spirit of Elektra that shines a light on the character’s personality in exciting ways. She brings duel ferocity and gentleness that made me recognize something I had never thought before – Elektra is like a cat; Playful when it suits her, but mysterious and often a supreme and bitter jerk when she doesn’t get her way. The same way that Charlie Cox and Deborah Ann Woll hold onto everything wholesome and good about love, Cox and Yung grab all of the dangerous and potentially hurtful parts and hang them out the window while speeding down the highway. The true achievement of Marvel’s Daredevil Season 2 is not how in how it escalates the stakes from Season 1 or how it manages to properly juggle new and returning characters with satisfying arcs, it’s in its narrative composition as a whole. Season 2 is perhaps the most comic book-like series on TV, because it mirrors the structure of comics in a way that ceases to feel like television. While the first season held onto the framework of serialized TV, guiding us through every turn, Season 2 takes the graphic novel approach. Clusters of episodes form their own cohesive arc for a few hours, but when all combined they form the grander story at hand of the season. And that larger story? A further example of the two dividends of Daredevil. Daytime Matt and nighttime Matt get equal footing, which you need in order to make them both special. As hard as it may be to believe, Daredevil‘s second season is a step up from the first. By embracing the comic book form, the series has further separated itself from the rest of the MCU and scratches an itch none of them can reach. It’s not all perfect though, as what worked the first time keeps working, and what didn’t work remains a drag, specifically the tired exposition wherein characters must explain to other characters the things the audience already knows. The drama screeches to a halt in these moments, but luckily they are few and far between. If you were as enthusiastic about the first season of Marvel’s Daredevil, I hope you’re as pleased as I am with the new episodes. There’s an intensity and toughness in the storytelling that gets at the heart of the character and provides further proof why Daredevil is the one of the best heroes in comics. The new additions to the series are welcome and only enhance the storytelling in thrilling ways, albeit there definitely seems to be holding back on the part of The Punisher’s story. It’s not a huge bummer though, as the series makes up for it with dark humor, clever shout outs and cameos, and enough heart to make Jack Murdock proud.